We will never know the whole truth and nothing but that truth, so after walking out of David Fincher's much hyped 'The Social Network' we are left wondering how much of this intriguing tale is actually fact. The basics have to be right? The people are all so believable, they aren't characters, they're just real and the events, it all must have happened just like that right? The thing about it is, Fincher's film is so straightforward it is hard to believe that any of this is an embellishment of the truth or at least some peoples version of it. Either way, everything you have heard about the movie is probably true. What makes the fuss around this film is not the usual reasons you talk about movies-there are no stars, no epic sequences of amazing camera work or special effects-what we have here that is so intriguing is the relevance of the story. 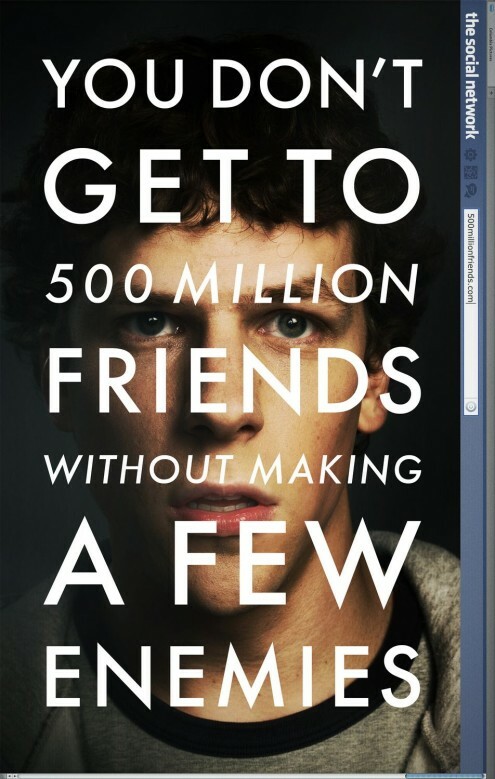 Relevance, it's the biggest thing 'The Social Network' has on its side, and that is a very good thing because it is very well made and completely enthralling. 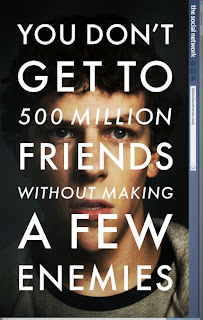 As our main protagonist and creator of facebook, Jesse Eisenberg plays Mark Zuckerberg with a fury of quick wit, intelligence and pure snarkiness. It is ironic that this squirelly college sophomore who turns to blogging to take his frustrations out after being dumped, this obviously socially awkward fella who has as many friends as you have fingers on one hand created the biggest social networking site in history. In that, is where we find our interest, in his accomplishment is our daily lives. As I write this review it is on the site that is the subject of the movie-that sounds all so backwards but proves how much our lives are dominated by what this man, this teenager at the time, did. From the opening scene, which chronicles the aforementioned break-up, we immediately are fed the tone and technique of the film. It is dialogue and character driven, it is within these interesting conversation that smart people have that we are told the story of the origin of facebook, the events that influenced the site, the people who were lied to and back stabbed along the way. Fincher shoots the movie very steady, no moving camera tricks, just static capturing the performances. He puts them in neutral colors and gives different points of view over one coherent story as to how this all went down. Who knew the creation of a website could be so rich with drama and deceit. Writer Aaron Sorkin delivers scene after scene that overlap and reveal the true colors of every person on screen. It is pure poetry and the actors, who have a huge job on this film, do the writing justice and bring this story to life. Timberlake is finally given a credible platform to stretch his acting skills and as Napster co-founder Sean Parker we can see him playing somewhat of himself, but with more of a flair for the attention getter. On the other end is Andrew Garfield who, after Eisenberg is the most affecting. As Eduardo Saverin he is our most empathetic character and the one we hate to see betrayed, the one we side with in the small intervals of attorney delegations, no matter how much we want to believe Zuckerberg did this without hurting anyone, the proof isn't there for that, but his character is much deeper than the jerk genius he comes off as on the surface. Armie Hammer also deserves to be mentioned for playing both Winklevoss twins who say they had the original idea that Zuckerberg drew on to create the facebook. There is so much to say about the film I can hardly express it all here, but that the goal of it was to be cool, to see what others are up to, to know who's in a relationship and who's not anymore, that the whole thing grew from the need for revenge on a scorned lover, of not feeling included or elite. It is what the world is about, it touches on so many human emotions and it is all filtered through a page of your very own on the Internet. It is a cultural phenomenon and we are lucky to have a film that chronicles how something big can come from the most basic emotions that we all share. It is jolting, effective, complex and nothing like you probably thought. I really, really, love your review. Thanks for writing it. Thank you, I really appreciate that and you taking the time to read it.